If you are a fan of custom wallpapers, you must’ve noticed that most wallpapers do not match the aspect ratio of current resolution. Sometimes, the favorite part of your wallpaper gets cut from the background. A while back, we covered an application called BackGrounder, which allows you to easily scale and trim images, enabling you to create custom wallpapers. Today, we have another application , namely Aligner that lets you align the wallpaper on your desktop according to your preferences. You can use this application to choose the part of wallpaper you want to keep in the center of the screen. Moreover, it lets you move the wallpaper anywhere on the desktop, in Top, Bottom, Left and Right direction. The application has a very simple interface. You can change the alignment of the wallpaper using two methods; it lets you specify the exact number of pixels that are to be used to move the wallpaper, or use sliders to change the position of the wallpaper. Aligner also provides you with a real-time preview of the changes being made to the position of the wallpaper. Once you’ve changed the position of the wallpaper, click OK to apply the changes. The application works flawlessly, but we feel that it can be improved by introducing some simple functions, such as resizing the wallpaper, showing the complete wallpaper in the preview pane, and a selection box to select which part to show on the desktop. 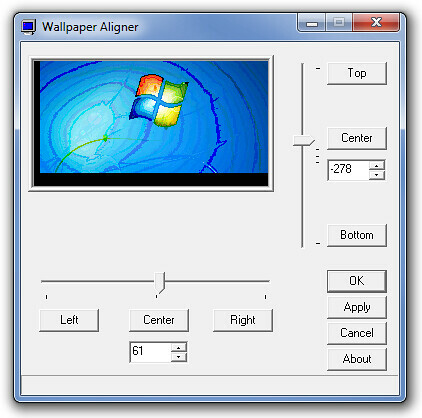 Aligner works on Windows 2000, Windows XP, Windows Vista and Windows 7. No Comment to " Windows: Adjust Horizontal & Vertical Position Of Desktop Wallpaper "